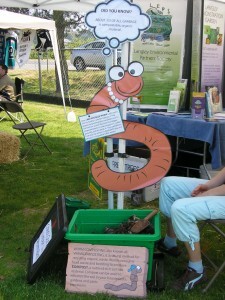 Composting with worms is a natural way to recycle kitchen scraps into a soil additive. It’s great for apartment dwellers, offices and school classrooms! 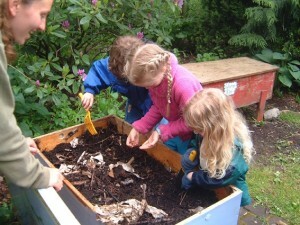 LEPS offers composting workshops for schools, special interest groups and the public. For more information visit our community workshops page. Worms like to live in a variety of bedding materials. Use a variety of bedding to provide more nutrients for the worms. Add two scoopfuls of fine sand to the bedding to aid in digestion. (Worms have a gizzard!) Bedding should be damp since worms need moisture for oxygen exchange. food a day. Start with a half pound of worms (so one-quarter pound of food scraps will be consumed each day). As they multiply you can add more food to the bin. Get worms from a friend’s compost bin or from an aged manure pile. You can also purchase worms from a worm farmer. Click here for a list of worm suppliers. Do not feed worms dairy products, meat products, oily or cooked foods or grains. to harvest when there is little recognizable bedding in the bin. The contents will be brown and earthy smelling. Don’t wait to harvest your “black gold” because worms do not like to live in their own manure. Once bedding is starting to look brown and unrecognizable, push the bedding to one side of the bin. Add fresh bedding to the other half. Place food scraps in the new bedding only. 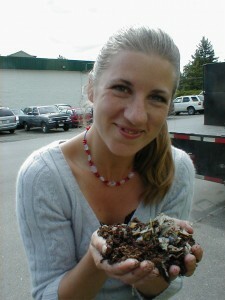 The worms will migrate over from the old materials to the new bedding, leaving the finished compost to be scooped out. If you want your compost immediately you must harvest the worms manually. Dump the contents onto a large plastic sheet under a bright light or the sun. Make several pyramid piles on the sheet. Worms don’t like sun so they will crawl to the bottom of the pile. Next, scoop off the tops and repeat this process until all finished compost is harvested. Watch for worm cocoons – tiny ochre, lemon-shaped sacks that contain baby worms. You will want to keep these so they can keep up the good work of their parents! Use your finished compost as a soil conditioner in your garden, potted plants and hanging baskets.